I have several times written that early western painting, until the late Renaissance, not uncommonly incorporated multiple copies of the same characters within a single painting, as a narrative technique. This article shows several examples and discusses its significance. The earliest post-classical painting in which I have seen such compound narratives is Margarito d’Arezzo’s The Virgin and Child Enthroned, with Scenes of the Nativity and the Lives of the Saints (c 1263-4). The panel in the lower right hand corner shows a story, taken from the Golden Legend, in which Saint Margaret the Virgin (of Antioch) is swallowed by a dragon (the devil), and emerges from that dragon because the cross which she carried irritated the dragon’s innards. This panel shows her being swallowed and emerging from below the dragon, in the same image. 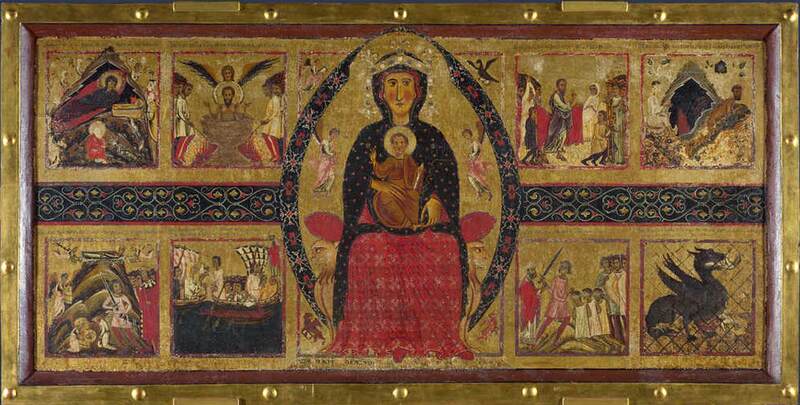 It is as a result of this story – which even the Golden Legend admits is apocryphal – that she is patron saint of pregnant women and childbirth. An even clearer and better-known example is Duccio’s Healing of the Man Born Blind (1308-11), a story taken from the Gospel of John, chapter 9. In this painting, the man is shown twice, once as Christ applies mud and saliva to his eyes, and then when the man has recovered his sight. Although Duccio’s perspective projection is not yet optically accurate, the entire painting has been brought into the same rough projection. Giotto di Bondone (1266–1337), Scenes from the Life of St John the Baptist: 2. Birth and Naming of the Baptist (1320), fresco, 280 x 450 cm, Peruzzi Chapel, Santa Croce, Florence. Wikimedia Commons. Giotto’s Birth and Naming of the Baptist (1320) composites two scenes in the early life of John the Baptist into a single painting by placing them in adjoining rooms, even though they took place at quite separate times. On the right, Elizabeth has given birth to him (although the crucial detail has unfortunately been lost), and on the left he is brought before Zechariah, his father who has been speechless since being told that his wife would give birth to John, who writes his name, before recovering his power of speech. 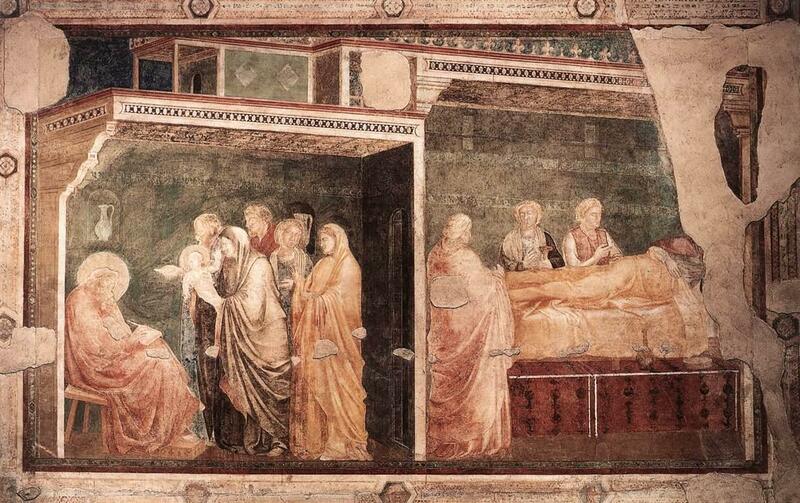 In his St. Peter Healing the Sick with His Shadow (c 1425-8), Masaccio cunningly compresses a sequence of three images into one, by placing the sick in a line and showing the healing effects of Saint Peter’s shadow on them in sequence: from front to back, crippled, rising, and recovered. This doesn’t result in any duplication of characters, but is an ingenious narrative technique. The Distribution of Alms and Death of Ananias (c 1425-8) shows a composite image incorporating the key elements of two separate but related stories: Saints Peter and John are distributing money to the poor, who are gathered in front of them. Lying on the ground at their feet rather incongruously is the dead body of Ananias, who comes from a separate story also relating to money. Masaccio’s panel Stories of St Julian and St Nicholas (1426) is another ingenious composite image, which sets two unrelated stories into a single view. On the left, Saint Julian the Hospitaller kills his parents while they are asleep in their bed, then he is shown a second time in the central alley, covering his face in despair at what he has done. On the right, Saint Nicholas looks into the house of a poor man and his daughters. Masaccio projects both scenes in common. In order to do so, the room at the right is rotated slightly, and he uses cross-sectional views. 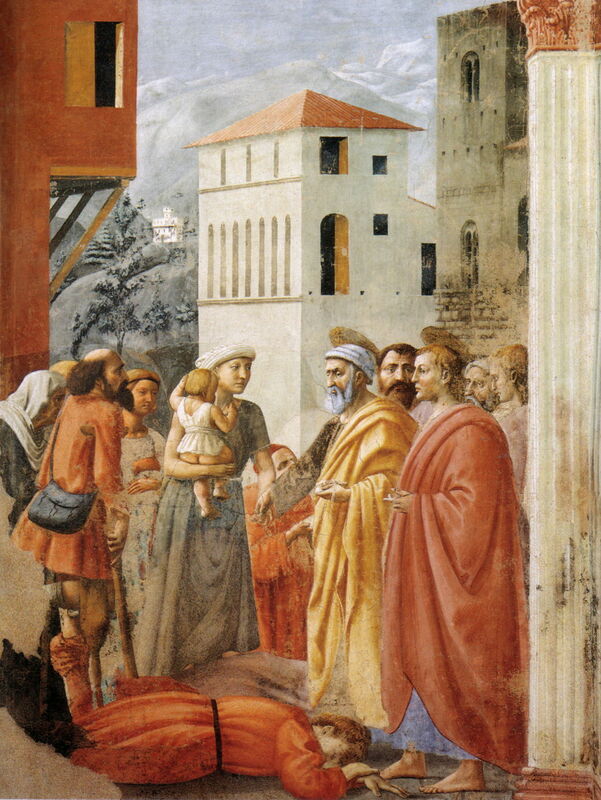 in Raising the Son of Theophilus and Saint Peter Enthroned (1425-8), Masaccio incorporates two stories set far apart in time by referring to the later story in a painting within the painting. The main body of the painting shows Saint Peter raising a boy from the dead. This miracle so impressed local people that they all converted to Christianity, and built a large church in the town. In the centre of that church they provided Saint Peter with a large chair, so that he could sit throughout the long sermons, and that is shown in the painting hanging at the right. 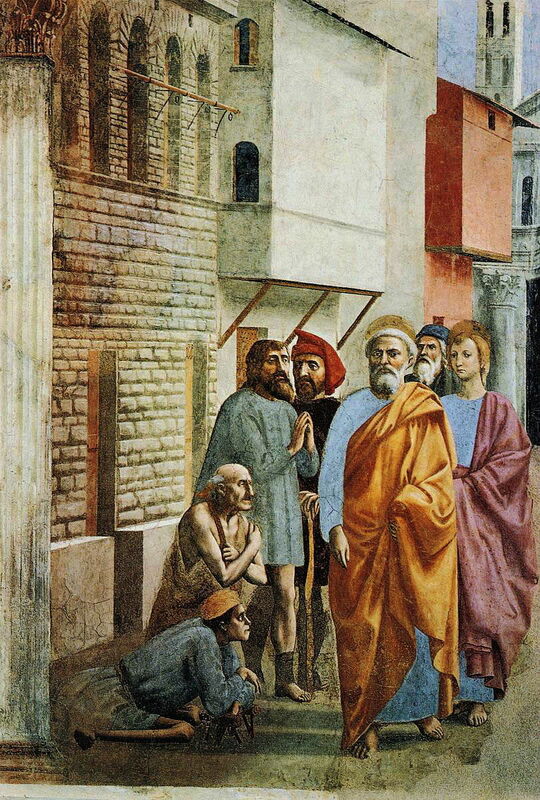 The Tribute Money (1425-8) is another of Masaccio’s ingeniously composited images, which shows three separate scenes from the same story in a single, coherent and projected image. 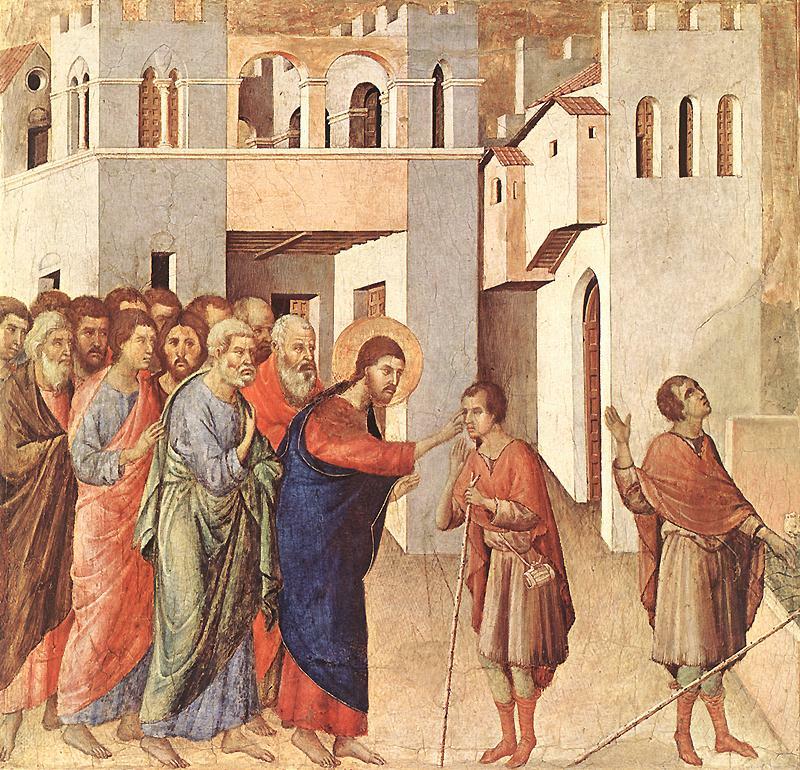 In the centre, a tax collector asks Christ for temple tax. At the far left, as indicated by Christ and Peter’s arms, Peter (shown a second time) takes a coin from the mouth of a fish. At the right, Peter (a third time) pays the tax collector (shown a second time) with that coin. Note that, unlike most other composite images, the story is not read in a simple linear order, such as from left to right. Masolino demonstrates his skills at combining stories into a single, projected image in Healing of the Cripple and the Resurrection of Tabitha (1424-5). The two stories were separated in both time and place: the healing of the cripple took place in Jerusalem, and the raising of Tabitha in Joppa considerably later. At the left, Saints Peter and John are shown healing a cripple, and Saint Peter appears again at the right having raised Tabitha from the dead. 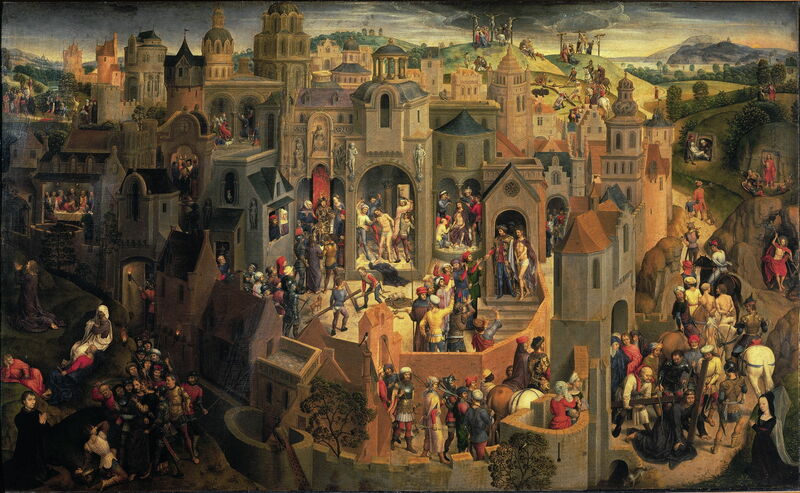 Hans Memling’s intricate Scenes from the Passion of Christ (1470-1) shows a (very imaginative) bird’s-eye view of Jerusalem, in which each of the major scenes in Christ’s crucifixion are placed. These start at the top left, with Christ riding into the city on Palm Sunday, weave their way down the left side of the painting, which includes the Last Supper almost half way down the left edge, then cross into the centre, for the flagellation. The narrative chain then runs down, turns to the right, and ascends to the crucifixion at the top. That is shown twice, to accommodate the descent from the cross, and scenes following the resurrection are towards the top right. Ten years later, Memling painted his Advent and Triumph of Christ (1480) using a similar narrative technique. This shows twenty-five scenes from the whole life of Christ, starting with the annunciation at the top left, omitting the crucifixion itself, and ending with the assumption of Mary at the lower right. The narrative thread is unfortunately not as clear as his previous Scenes from the Passion of Christ. Working in the Brancacci Chapel almost 60 years later than Masolino and Masaccio, Filippino Lippi composed the last two episodes from the story of the life of Saint Peter into a single painting. To the right we see him, with another saint, in dispute with Simon Magus in front of the Emperor, then to the left, Saint Peter’s later crucifixion. Lucas Cranach the Elder’s The Garden of Eden (1530) gathers six different scenes of the Biblical story of the Fall of Man in the same composite view. To the left of centre, in the distance, is the creation of Adam; Eve is then brought out of Adam’s rib in the far right. To the left of that the couple are together, before God talks to them both (centre), then Eve tempts Adam with the apple (mid left). 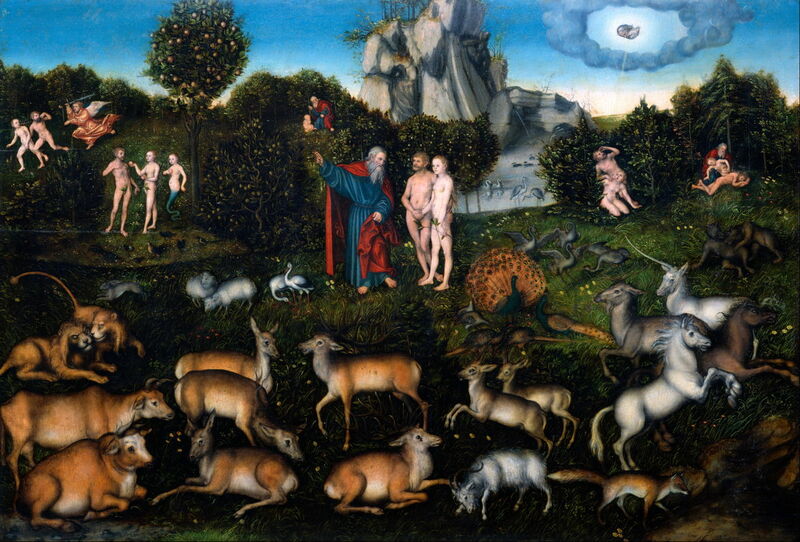 The sequence ends on the far left, with Adam and Eve being cast out from the garden. These examples have, I hope, shown that such paintings are not exceptional, nor are they strange in any way: during this period, it was perfectly acceptable to combine different stories, or scenes from the same story, into a single pictorial space. Andrews refers to them as having ‘continuous narrative’. Although this term is in other respects a good one, it does not result in a comfortable complement, in which a single pictorial space contains only those elements from a single moment in the narrative: the most appropriate term for that might be ‘monoscenic’, perhaps, which Andrews also uses. Historically, these occurred as western painting was making the slow transition to realism and naturalism which was a major feature of the Renaissance. However the switch to monoscenic narrative painting occurred after people and objects were given volume and shading, and after scenes were being shown in linear perspective projection. To the modern eye, the more symbolic representation used in late Middle Ages painting (before 1400, say) is perhaps better accommodated. To see quite real-looking figures in carefully projected and coherent linear perspective which are manifestly not monoscenic comes as something of a visual surprise to those used to looking at photographic images for their entire lives. During the 1500s, as painting became ever more realist and naturalist, its narratives tended to become restricted to being monoscenic. There is no inherent reason that they should be monoscenic – if the viewers of the Renaissance were able to read such composite pictorial spaces, or continuous narratives, then surely we can too. We also have the benefit of composite photographic images resulting from the studies of Eadweard Muybridge (1830-1904) and many since. Posted in General, Painting and tagged Cranach, Duccio, Giotto, Lippi, Margarito, Masaccio, Masolino, Memling, Muybridge, narrative, painting, renaissance. Bookmark the permalink.